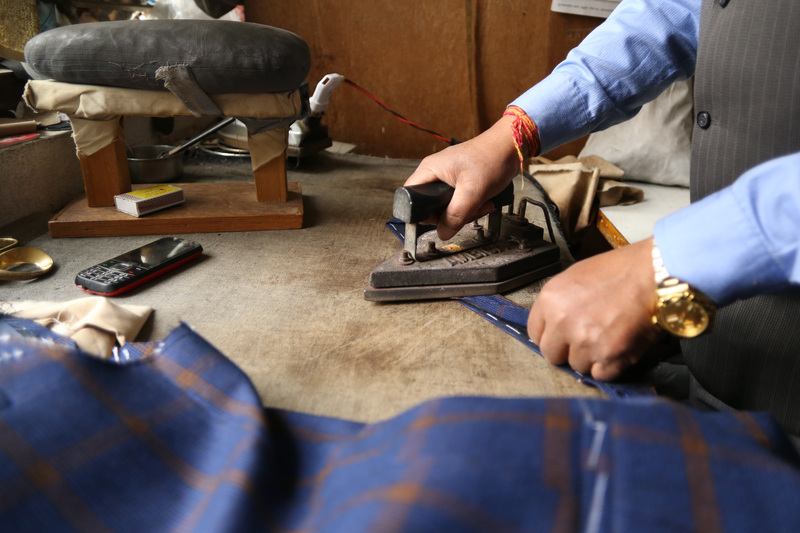 For over five decades, Krishna Man Kapali has been tailoring suits for Kathmandu’s top politicians, businessmen, mediapersons, and former royals. Kapali was sixteen years old when he started his career as a tailor at Model Tailors in New Road. While that shop is no more, back in the 60s, Model was known as one of the best and biggest tailoring places in Kathmandu, so much that even the royals got their suits tailored there. Model catered to diplomats and Kathmandu’s elites at the time and had a reputation for delivering the best service in the line of business, says Kapali. “I have had a few royals wear the jackets and waistcoats I made with my own hands,” says the 69-year-old Kapali, who spent the first 13 years of his career at Model. Like any ‘straight A’ student, when Kapali realised that he had mastered the craft of suit-tailoring, he moved on to open a tailoring shop of his own, in partnership with a friend. When that shop didn’t work out, he moved on again to start SS Tailors, this time under his sole proprietorship, in 1983. While starting your business comes with its own share of risks, Kapali’s craft acted as his safety net. Thanks to his meticulous work, he earned a loyal clientele that has followed him wherever he went. Kapali maintains a manual record book that lists all his clients. Every client is given a symbol number and every symbol number leads tailors to the client’s page, which comes with precise measurements and special needs. Unless the client has put on or lost some weight, once noted, the measurements are enough to get Kapali’s team going without the client’s physical presence. A quick peek into the book reveals that his clientele consists of former royals, diplomats, ministers, bankers, CEOs, mediapersons, and intellectuals—the who’s who of Kathmandu. Kapali would rather not reveal any names because many of his clients attach an Armani tag to his suits after he’s finished, he says. When the first suit is done right, the orders to follow can be coordinated through phone calls. “Most of my clients send in their chauffeurs for the delivery of the fabric and the pick up of the final suit. However, there are some who value precision and will come to the shop themselves, even if it’s in the off-hours to make sure that the suit they get is the suit they have asked for,” he says. But often, Kapali doesn’t wait for his clients to visit him; he goes to them. Some clients are so busy that they only have their lunch hours to spare, so, Kapali and his team visit them in their offices to take their measurements, he says. The master tailor, however, admits that he’s not the go-to tailor for locals in his community. “Our suits come at a premium price and our neighbours tend to steer clear of us,” he says. But once someone makes a suit at SS Tailor, Kapali stays their tailor for generations. His record books list a few families whose generations have tailored their suits with Kapali. SS Tailors has a relatively small team of tailors as it’s very important for Kapali that his teammates understand the legacy and the value of the craft. “It’s not about how many suits or how much money we make. There are many tailors whose primary focus is cash. People come looking for us because we believe in the craft, and hence, I need a team that believes in the same. Our suits are on par with the suits that our clients bring home from abroad and that quality cannot be compromised,” he says. Kapali keeps up with the latest trends, and his clients are quick to introduce him to the newest collections from luxury international brands. He doesn’t hesitate to try his hand at new designs; however, he is admittedly stubborn when it comes to the techniques he applies. “Yes, there are new machines to make the work easier and faster, but there’s nothing like handwork,” he says. While most tailors across the country have moved on to chalk for marking, Kapali still hand-sews the linings to make sure the seams on the garment’s interior and exterior are perfect.